Bruce the Shark in 1975's great white classic Jaws may have looked a little on the fake side, but at least he had a lot of personality. That can't be said for the millions of CGI sharks that have been dumped on audiences at an expedient rate over the past decade. And now, one filmmaking team has set out to deliver the ultimate answer to all those bad shark movies with Bad CGI Sharks. It's exactly what it sounds like. While Jaws may have been a masterpiece, nearly ever shark infested thriller that has arrived in its wake is schlocky dreck that drowns most audience members in a sea of craptacular chum. Jaws 2 celebrates it's 40th anniversary this year, and while it has its fans, it was the first in what would be a tidal wave of almost unwatchable shark themed movies. And as the story lines keep getting worse, so do the sharks. We've seen Deep Blue Sea, Sharknado, and The Meg just to cover the highlights. All movies featuring CGI sharks. Now, those CGI sharks are brought into the real world. 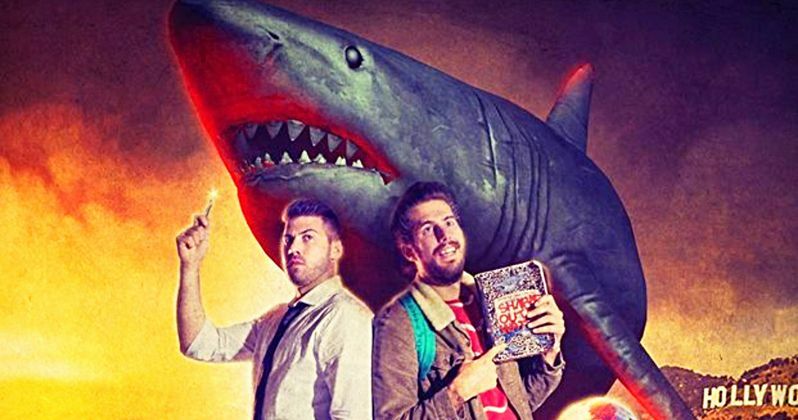 In Bad CGI Sharks, two estranged brothers are brought back together when a script they're writing comes to life and sends a poorly rendered digital shark to hunt them down in this meta take on the sharksploitation genre. This is really the Millennial answer to bad shark movies, and it comes packed with all the whiney shark snark they can muster. This movie is so lazy, it doesn't even bother giving potential fans a tag line, rolling in past 10 am looking disheveled and thinking its so funny, it forgot to make everyone else laugh. But that's the joke, right? Let's hope so, or Bad CGI Sharks is just as bad as every bad shark movie it's lampooning. The movie comes from director MaJaMa, which we can only assume is the hipster nickname of the collective Matthew Ellsworth, Jason Ellsworth and Matteo Molinari who share co-screenwriting credit. The trio also cast themselves in all the important roles in the movies, because why not. Millennials are a self important bunch, and as the recent Pet Sematary documentary proved, these dudes need to be in front of the camera even if they don't belong there. Watching the trailer, the verdict is still out. Majama have launched their own teaser and trailer for the movie, along with a tag-free poster. Why label trash when you know it's trash? Again, I'm pretty sure that's supposed to be the joke. So, if you like the blistering millennial humor of slick-haired hipster Ryan George, this should fit perfectly into your comedy wheelhouse. It has the same disaffected stance on all things bad, though in turn, it becomes worse than whatever its skewering. But, that's the joke. Right?